Earn $1.43 in VIP credit (143 points)What's This? 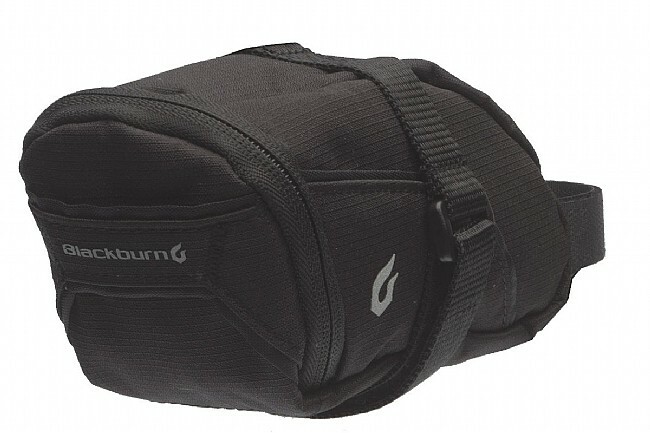 The Blackburn Local Small Seat Bag keeps it simple with its 0.5 L capacity, providing enough room for a tube, tire levers, and a small CO2 inflator. Simple hook-and-loop attachments securely fit around any seatpost and saddle combination, and the wide zippered opening provides easy access. Features reflective accents and a light loop for clipping on a rear blinky. Seems to be well made. When I purchased online - I tried to get a bag that would hold 2 tubes, 2 tire levers, and a small patch kit. This one will hold the tubes & levers. I cannot squeeze in anything else. I hate swapping seat bags, so when I went to put together a third one (consisting of a mini-pump, tube, lever, and flat multi-tool) I tried to find another Pearl Izumi tailgate, my preferred bag. Turns out, it's been discontinued (maybe in favor of the PRO bags). However, Blackburn's model is very similar in the ways it counts. All the aforementioned items fit just fine (esp. the pump), the price is right, it's light, not garish, and has a lifetime warranty. The only miss would be lack of a reflective panel on the back, but to me this is close enough to be satisfied.